This article originally appeared on the website of Ohio State's College of Food, Agricultural, and Environmental Sciences. COLUMBUS, Ohio – The August 2014 water crisis in Toledo, Ohio, impacted Ohioans’ views of Lake Erie algae problems by increasing the attribution of blame of algae growth on crop and animal agriculture, as well as increasing the levels of reported fear and concern among citizens, said Brian Roe, an economist in Ohio State University’s College of Food, Agricultural, and Environmental Sciences. Through an initial analysis of survey data gathered before and after the crisis from a sample of Ohioans, Roe seeks to understand if the Toledo water crisis and its media coverage reshaped Ohioans’ views of water quality in Lake Erie, their views on the role of agriculture in impacting the health of the lake and their thoughts on the types of policies needed to stem the continued growth of harmful algal blooms. The research was funded by the National Science Foundation through a program that studies the dynamics of coupled natural and human systems. Support was also provided by Ohio State’s Climate, Water, and Carbon Program and the college’s Field to Faucet Initiative. Research partners on the study include Erik Nisbet from Ohio State’s School of Communications and Greg Howard from East Carolina University. Roe, the McCormick Professor of Agricultural Marketing and Policy in the college’s Department of Agricultural, Environmental, and Development Economics, discussed the initial findings from the research during the college’s recent Agricultural Policy and Outlook conference series. From Aug. 2-4, 2014, nearly a half million Toledo residents were ordered to not drink, boil and in some cases bathe in water from the Toledo municipal water supply due to the presence of harmful algal blooms in Lake Erie, the source of the city’s water. The blooms resulted in the city water containing more than double the allowable threshold of microcystins, which can cause numerous health problems, Roe said. During the extensive media coverage of the event, many blamed the agricultural sector as the root of the problem due to agricultural runoff from farms in the region, he said. Roe and his colleagues administered surveys last March to an online sample of more than 1,000 Ohio residents. This initial data collection attempted to understand the awareness of Lake Erie algae issues among respondents and to gauge their willingness to pay for various policy interventions to stem algal blooms, he said. The researchers later administered a second survey to a subset of 400 people who completed the original survey to analyze their thoughts on Lake Erie algae post-crisis. Roe said the second sample, which is still being analyzed, “While not representative of the Ohio public,” will provide some first insights into Ohioans’ response to the event. “Respondents were asked a sequence of questions that will help us to understand public sentiment and concern about Lake Erie water quality; the respondent’s perceptions of the role of both crop and animal agriculture in affecting water quality issues in Lake Erie; and the depth of support for possible policy responses,” Roe said. Examples of questions asked of survey participants include, “What do you think is causing the increase in algal blooms in Lake Erie over the past few years?” with a rating system for eight different possible sources, including animal agriculture, crop agriculture, industrial sources, natural weather cycles, urban sources, residential lawns, climate change and rural septic tanks. 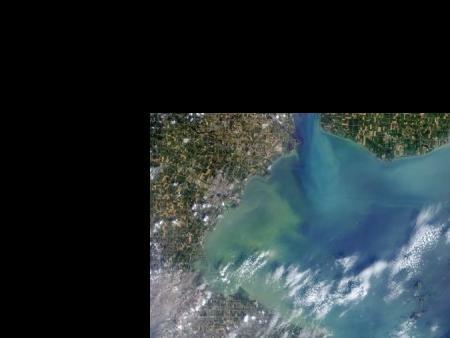 Additionally, survey participants were asked to rate the level of risk algal blooms in Lake Erie pose to human health, the Ohio economy and their family, and to rate their levels of concern, fear, anger and worry over the Lake Erie algae issue, he said. In their analysis of the data, the researchers found that the media coverage of the event did shift some perceptions of the causes of Lake Erie algae among survey participants, Roe said. There was a 4.1 percent increase in contributing blame to animal agriculture for Lake Erie’s algae issues after the Toledo water crisis. The blame on crop production increased by 3.4 percent, while the blame on weather increased by 3.8 percent. After the water crisis, the blame shifted away from industry by -5.3 percent, urban sources by -1.7 percent and rural septic tanks by -1.8 percent. However, Roe and his colleagues found that there were no changes in the survey respondents’ perceived quality of Lake Erie’s water, which respondents rated as low quality in both surveys. Additionally, there were no changes in the participants' willingness to pay to reduce damages from algae, Roe said. Roe spoke during the December kickoff of the college’s 2014-2015 Agricultural Policy and Outlook series. The series features agricultural policy and economic outlook meetings at numerous locations across Ohio through Jan. 29. The meetings feature presentations by AEDE experts on key issues in the agricultural community for 2015, including policy changes, key issues and market behavior with respect to farm, food and energy resources, and the environment. The Agricultural Policy and Outlook series meetings are open to the public. A meal is provided with each meeting and is included in the registration cost. More information on the meetings, including policy briefs and presentation files from each of the presenters, can be found at go.osu.edu/2015outlook. To read Roe’s policy brief prepared for the 2014-2015 Agricultural Policy and Outlook series, visit go.osu.edu/vuz.